iRobot launched the Roomba i7+ robot vacuum with Clean Base Automatic Dirt Disposal. The product brings a new level of intelligence and automation to robotic vacuum cleaners with the ability to learn, map and adapt to a home’s floor plan. Introducing Imprint Smart Mapping, the Roomba i7+ remembers multiple floor plans and room names so users can customize cleaning jobs and direct the robot to clean specific rooms by voice or via the iRobot Home App. When the appliance is finished cleaning, it empties its own dust bin into the Clean Base, which holds 30 bins of dirt, allowing customers to forget about vacuuming for weeks at a time. 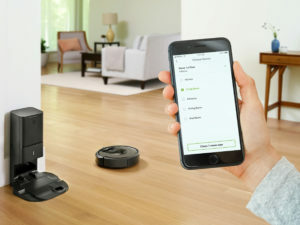 “iRobot is addressing a long-standing customer call by giving Roomba the ability to empty its own bin after each cleaning – said Christian Cerda, COO of iRobot -. This enhances the customer experience by eliminating the dusty and dirty mess often associated with emptying vacuum canisters. With the ability to remember the home, clean specific rooms and empty itself when its finished, the Roomba i7+ with Clean Base Automatic Dirt Disposal quite literally frees customers from every aspect of vacuuming – from start to finish – for weeks at a time”.